Got a little bit of time to work on a couple of Fomorian heroes! Both in varying stages of completion. The one on the left (former Troll Outpost figure) is about 80% painted, and still needs a base. Just started converting the one on the right. Still need to clean up the neck joint, sculpt feet and a tail before I can start painting. I have decided that I am completely on board with the idea that Fimir reproduce by burying sacrificial victims alive in the swamp and engaging in some sort of spooky voodoo to raise them back up as new members of the clan. I figure all of those variables can account for the subtle differences in in morphology of some of the figures (number of digits, digitigrade vs. plantigrade, etc.) and also relates to a few different fantasy sources I dig. Still working out what to do about further conversions (still waiting on Reaper Bones 3 Kickstarter delivery...) Also thinking about allied or mercenary troops. Thinking about half-orcs, undead, or....? Good to see projects getting back on the table. Something I need to do myself. Nice background idea! Who are their victims? Anyone they can get? Prisoners of war? Do they have to be big 'uns already, or is their new size / rank part of the magic? Or a reflection of their former status / prowess? So many questions! :) Thinking of allies, is there a Cult which helps them find victims, or even a client race of warriors who aspire to become Fimm? Also, I just like to say "bullywugs" because it makes me laugh. So: bullywugs? Victims are primarily humans, with occasional halflings. More rarely, elf, orc, dwarf, or whatever. My concept is that the magic is a bit primitive & unreliable, so that would account for the diversity. But I suppose maybe there could be some impact on the transformed Fomorian. Like maybe an ogre turns out larger -- which is a perfect excuse for the next conversion coming up on my table! As far as allies, I like the idea of the Fomorians as isolated, outcast, and a bit alien to the other races. I also like their place as a struggling underdog. In my concept, they work with other primitive and/or supernatural types. Moor hounds, elementals, beasts, and (non chaos) daemons, etc. As far as the more intelligent races, I'm thinking they may have some contact & involvement with those who share their position in the world... goblins, half-orcs, the odd necromancer & their minions. 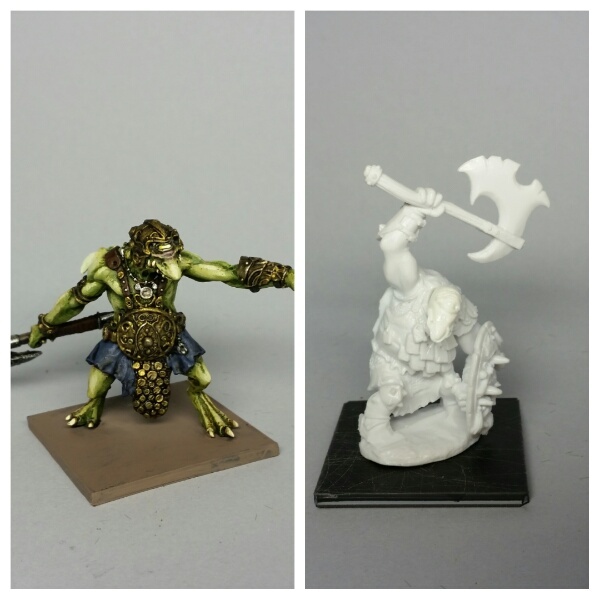 I've also been simply looking for figures that would look cool -- so I've looked at some bullywug types, Reaper make a few turtle-men, I've got some old (Ral Partha?) mushroom-men. Open to more ideas. Oh, I do love a half-orc. I've got a full set of the 1984 C10 Half-orcs, and a big regiment of the Half Orc Regiment of Renown (Mudat's mercenaries?) No, you can't have them! ;) They aren't often modeled as a military force, though there are lots of RPG character models... I don't know what others to suggest? So I've been looking at orcs that fit my image. Currently at the top of my list for both aesthetics, availability, and affordability are Black Tree "Orcs of the Crimson Wave" (such as these: https://eoeorbis.com/collections/fantasy/products/fa0255-orcs-of-the-crimson-wave-i?variant=1314879180 ). Possibly supplemented with a few of the old Bob Olley & Sandra Garrity orcs from Reaper. Maybe work in a few odd evil/ugly looking humans when I come across them. A diverse, motley group would look good to me.